The Bryce Harper era is over, and we move towards Victor Robles and Juan Soto to replace him. We saw what Soto can bring last season, and we like what we saw. Robles is a speedster with some power, and is a Rookie of the Year candidate in the National League. Washington made a sneaky good move in adding Brian Dozier and Yan Gomes. Both are strong power bats from the right side. If Adam Eaton can stay healthy, he will be a solid table setter in front of some strong power bats. This is a very good Nationals lineup, and they have a bit of everything. We can’t forget about Trea Turner, who has huge upside in steals. The only downside is a sliding Ryan Zimmerman at first base, but he does flash his old production at times. The signing of Patrick Corbin shook up the division a little bit, mainly because tides were starting to turn. Bryce Harper might be on his way out of Washington, but Corbin coming in gives them another ace caliber arm in addition to Stephen Strasburg and Max Scherzer. Corbin had a career year in 2017, boasting a 3.15 ERA, and career high 30.8% strikeout rate. Adding these types of numbers into a rotation with those other two names is going to be huge for their potential season outlook. Washington was 15th in team ERA last season, which might have been surprising for some of them. They will likely make a huge jump with this rotation. It was another big year for Max Scherzer. He had a 2.53 ERA and hit 300 strikeouts. He also won 18 games and pitched 220 innings. 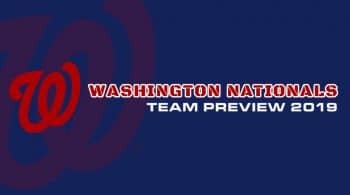 Scherzer is also projected for another dominant season as the true Washington ace. As mentioned, the addition of Corbin to Scherzer. There is a chance this team can lead the league in strikeouts. Corbin and Scherzer combined for 546 strikeouts. Strasburg’s health seemingly lets him down at least once a season, and he has been dodging more lengthier trips the last two seasons. Strasburg pitched 130 innings last season, but looked like his usual self when he did. Projections have him at a slight increase in innings, posting over a strikeout per inning. We might forget how good Strasburg is because he is next to some great pitchers within his rotation. Washington made some major upgrades to the back of their rotation. For one, Corbin is basically replacing Gio Gonzalez. Anibal Sanchez is replacing Tanner Roark. Sanchez looked very good last season, and his strikeout stuff was back up. While the ERA is projected to be a full run higher, the strikeout per inning stuff is expected to stay put. Their fifth starter is going to be Joe Ross and Erick Fedde. Ross is the brother of Tyson Ross, and they are similar arms. Ross relies on his slider, but has struggled against lefties. 2018 was a quick trip in the majors and he is looking to rebound.